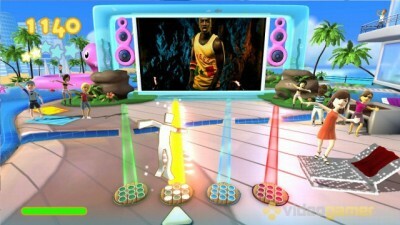 Dance Paradise simplifies Kinect's dancing, but loses a little of the excitement along the way. However, for families with kids over 12 this is the best Kinect dance game so far. Kinect has quite rightly triggered a lot of dancing games - its limb tracking technology makes it perfect for these exuberant experiences. While I appreciated the finesse of Dance Central's delivery that steadily taught me how to dance, I still wanted to see my avatar mirror my moves on screen. True, Dance Evolution (Dance Masters elsewhere), although missing a few steps in terms of delivery, got a little closer to this by placing the video feed from the camera alongside the scantily clad onscreen dancers. 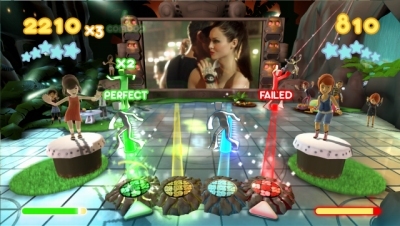 But I was still waiting for my Kinect Sports of dancing games - which opens the door nicely for Dance Paradise. Straight off things looked promising with use of the 360's avatar system. This not only means the game can easily synchronise your moves with their clear bodily depiction but can also take advantage of accessories and outfits you may have won elsewhere. The dancing here is quite novel and imports a trick from Guitar Hero and Rock Band. Rather than one set of moves to copy you are presented with four coloured lanes. Down each lane travels a little dancing silhouette man. When he reaches the spotlight at the end of the lane you need to start pulling off his particular move - mirroring his motions in your arms, legs and body. But as well as matching his moves you also have to orient yourself in front of his lane. 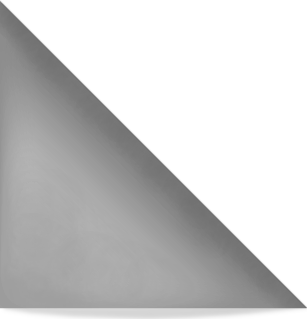 This is achieved by moving left and right in front of the Kinect camera. It's a novel way to differentiate the different moves and makes it easier to keep track of what's coming next. 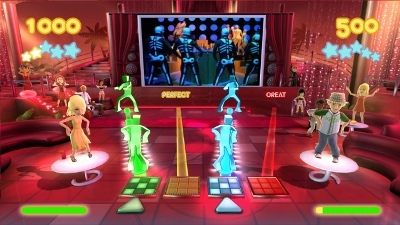 The downside though is that this makes Dance Paradise feel a little more complicated than other Kinect dance games. Also, because you are moving your feet left and right to be in the correct lane, moves that ask you to work your legs seem almost counter-intuitive - and if you're not careful you slip out of position while dancing. Straight off things looked promising with use of the 360's avatar system. Once you have acclimatised to this different approach, it does get a lot easier. In fact after an hour I could cope with songs on the hard difficulty - something I struggled with on both Dance Evolution and Dance Central. But although the difficulty is dialled down, the game still includes music videos in the background which makes it a little less family friendly for younger players. Given some time and you start to naturally move into position ready for the next move, but it makes the dancing experience feel more technical and stilted. The real wonder of Dance Central (and Dance Evolution if you have the perseverance and skills required) is that there comes a point when the dance starts to flow - your muscles take over as the choreography clicks. This never really happens in Dance Paradise because you have to keep track of these four lane positions. In broad terms, Dance Paradise gives good feedback on your dancing. If you hit a move spot-on you can see your avatar on screen copying the move precisely. If you miss a move they wobble off beat. I had hoped that the avatar would use Kinect to exactly mirror your movements - like in Kinect Sports - but the movement here is pre-rendered. I'm sure this makes the avatar's dancing look much better but the loss of instant feedback is a big price to pay. Other than that, the use of the 360 avatars really makes sense. It gave me an instant connection to my on-screen dancer, and the ability to win new outfits and accessories for him was a big incentive to keep dancing. Dance Paradise comes very close to being my definitive family dance game on the 360. The multiplayer modes are also well thought through. 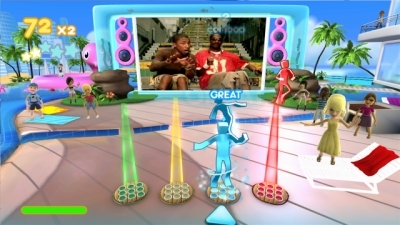 There's simultaneous Head to Head, Dance Off and Synchronise modes that gets two players dancing with or against each other. There's also a jump in, jump out ten player co-operative mode that is great for parties - although setting up all the 360 avatars takes a little time. Dance Paradise comes very close to being my definitive family dance game on the 360. 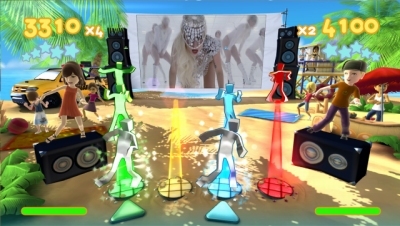 But if I could take Dance Central's progression and feedback, inject Paradise's avatars and add a little bit of Dance Evolution's difficulty I think we'd have the perfect mix. 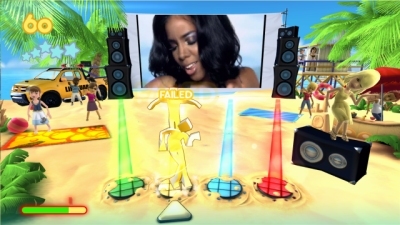 As it stands Dance Paradise is a strong family friendly dance game on Kinect. Unfortunately though, the slightly complex dance system along with the PEGI 12 music videos make it suited for older family members. 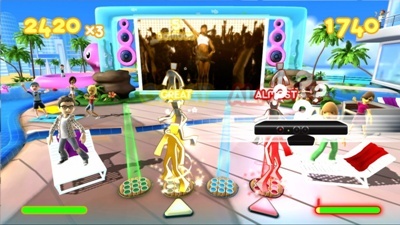 It's strange to say it, but for families, all three Kinect dance games have a lot to learn from Just Dance 2 (Wii). The time is still ripe for The Michael Jackson Experience (from the makers of Just Dance 2) to capitalise on all this when it is released for Kinect next year.